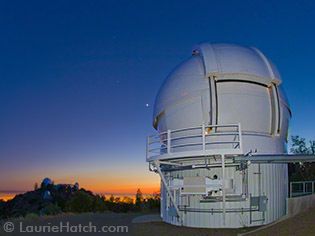 Lick Observatory's newest telescope, the APF, was fully commissioned on Mt. Hamilton in August 2013. This is the first telescope capable of detecting rocky planets that might support life in other solar systems. Extrasolar planetary research has been very successful at Lick Observatory. By operating robotically on every clear night of the year, the APF is efficient in discovering extrasolar planets. The Levy spectrometer has cutting-edge components and higher resolution, whichincreases astronomers' ability to detect these planets. APF consists of a 2.4-meter automated telescope and enclosure, and the high-resolution Levy spectrograph. The telescope and spectrograph operates robotically every night, like the KAIT. APF targets a preprogrammed list of nearby stars and observes them every night for months, in search of rocky planets with very low masses, similar to Earth. The ultimate goal of extrasolar planet research is to find planets like Earth that may support life. The spectrograph was designed by UCO's Steve Vogt and built at UCO's Technical Facilities. Named for Gloria and Kenneth Levy , who supported its construction with a generous donation, the spectrograph uses a large camera to bring the light to focus on a CCD. The spectrograph then analyzes and records the spectrum of this light. 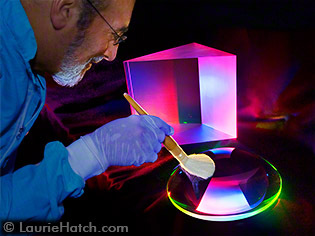 In the photo below optics technician Dave Hilyard cleans and inspects one of 10 lenses through which light passes. In the background is the camera's large dispersing prism. The sensitive Levy spectrograph is optimized for speed and radial velocity precision. It detects velocity changes in each star's movement down to 1 meter per second, equivalent to human walking speed. This change in a star's velocity could indicate that planets are pulling on the star with their gravitational forces. Since the spectrograph detects the smallest possible velocity changes, planets of lowest possible mass can be detected. This enables astronomers to find small rocky earthlike planets. Spectrographic data is fed into an extrasolar planet data pipeline, which astronomers then analyze to discover new planets. Construction of the APF was an international project. The mirror glass was cast and shaped in Russia and optically figured at Rayleigh Optical in Baltimore, MD. The telescope body was assembled in Tucson by EOS. The dome enclosure was fabricated in Australia. The spectrograph was designed and fabricated in California. To learn more about APF, also known as RPF (Rocky Planet Finder), visit the Rocky Planet Finder website. To learn more about extrasolar planet hunting at Lick Observatory, visit the Lick Observatory research webpage. To learn more about extrasolar planets and research methods, visit the California & Carnegie Exoplanet website.